E-mail campaign approval settings are useful to ensure that communications are sent to recipients free of errors and within branding guidelines. E-mail campaign approvals are set-up at an administrator level and the settings are applied to individual Send accounts. Email Marketing Administrator security role assigned to your Microsoft Dynamics CRM user. Send admin account linked to your Microsoft Dynamics CRM user. 1. In your Microsoft Dynamics CRM, open the main menu and click on the Settings button. The page will reload and the blue navigation bar will be updated with the Section name. Click on Settings and a new menu will open. Then scroll to the right hand side until the Send Admin button appears. Click it. 2. On the Send Admin page click on the Users tab. 3. Find the Send account you want to set-up the approval for and then click on the grey button located in the same row of the Send account at on the right hand side of your screen. A drop down menu will open. Click on Settings. 4. A new pop up will load with the settings option. Click on the Approval tab. 5. 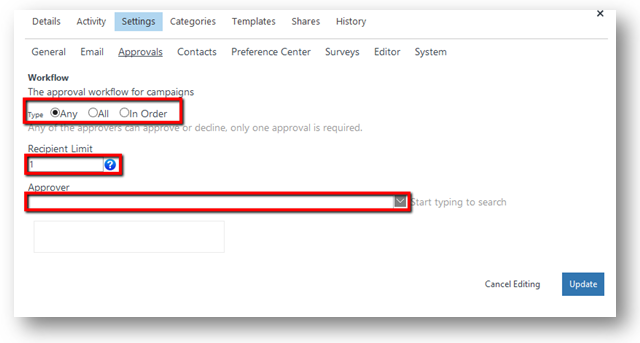 Once in the approval tab the first step is to enable the approval for that Send account by clicking on the Setting “Campaign Approval”. 6. Change it to ‘On’ and click on Update. 7. You will be redirected back to the approval tab. Click on the Workflow setting. 8. In this page you need to set the type of approval you want to create, set the limit of recipients in the e-mail campaign, (if the e-mail campaign has less recipients than the number set in this field it won’t require approval), and the approvers. Finish editing by clicking on Update. Your approval is ready! Please find more information about the Approval Workflow below. Any – You can add a range of approvers, and any one of them can approve a campaign. ALL – All the assigned approvers need to approve the campaign before it can be sent. When using groups, only one approver from each group is required to approve. In Order – The assigned approvers need to approve the campaign before it can be sent. The approval process will go in the order that the approvers are listed at the bottom. If an approver from one group declines the next is not notified and the approval is declined. This defines what campaigns will need to be approved based on recipient quantity. i.e Recipient Limit: 1 = you approve all campaigns, Recipient Limit: 10 = you approve all campaigns with 11 or more people. Select approvers from list or start typing to find their name. To arrange the approvers in a different order, click the 6 dots to the left of their name and move up/down in the order. 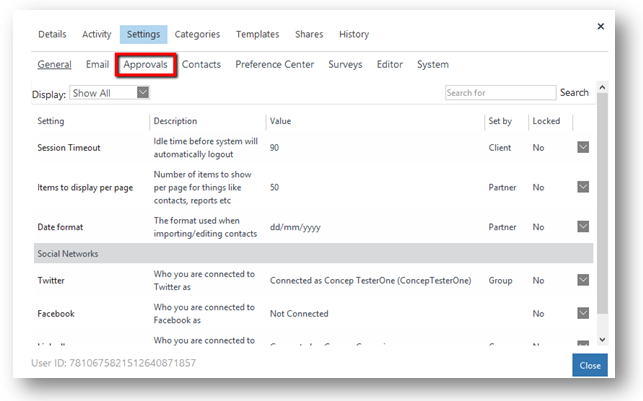 - Changes on the approval configuration can take up to 4 hours to start working in your CRM. - Non-scheduled e-mail campaigns will be sent straight after the last approver approves it.